Showcasing the birthstone for June, this beautiful freshwater pearl ring is crafted from sleek sterling silver with pretty twist design featuring 9ct yellow gold accents for a luxurious feel. Encrusted with shimmering diamonds for a sparkling finishing touch, this is the perfect gift if her birthday is in June. 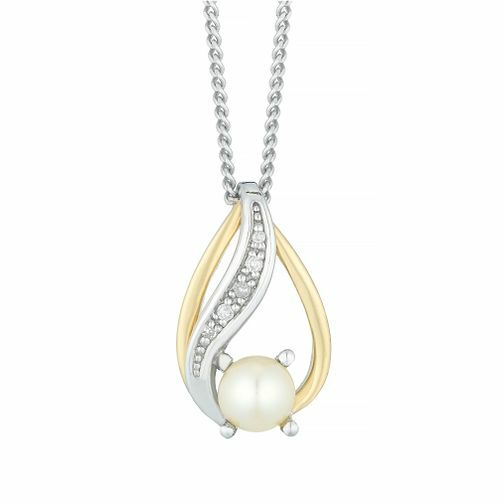 Silver and 9ct Gold Pearl and Diamond Pendant is rated 4.0 out of 5 by 1. Rated 4 out of 5 by Anonymous from Beautiful Delicate Necklace The pendant wasn't as big as it appeared to be from the image on the website however it was beautifully made and looks very nice on, made a lovely present.